ProXR is a radical departure from traditional bat design. It is distinguished by an ergonomically correct, angled knob that works with the range of motion of the batters hand to deliver ultimate performance, control and power. ProXR works with the changes that occur between the bat and the batter’s hands during a baseball swing. By reducing compression forces that fight a batters swing, ProXR provides performance advantages to the batter – more precise bat control, greater plate coverage and better transfer of power from the hands to the ball. Baseball bats with knobs at the end of the handle have basically been the same for over 135 years. When bats were first developed, players didn’t hold the bat down on the knob, they choked up on the bat. The knob acted like a restraint to prevent the hands from slipping off the end of the handle, but the knob did not come in contact with the batters base hand during the swing. Fast forward 135 years and the bat knob is still basically the same – it’s still round and on the end of the bat handle. 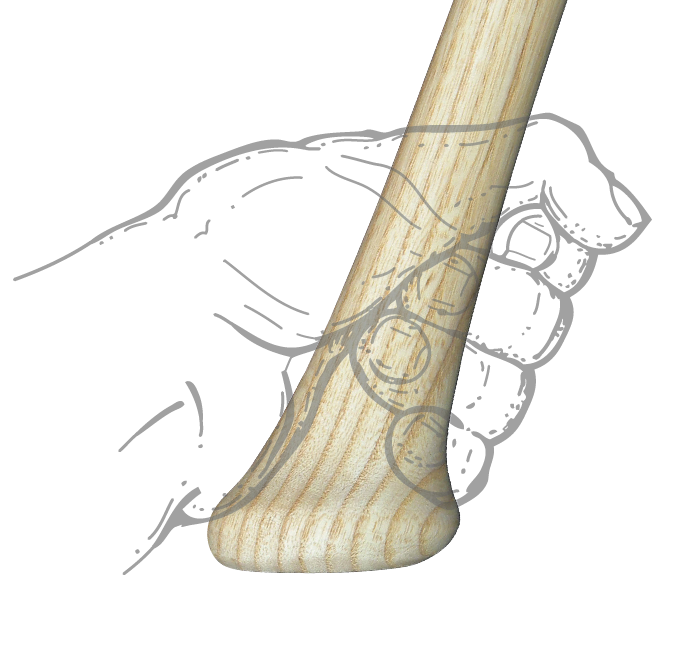 The big difference from then to now is that the batters method of gripping the bat has changed from up on the handle to down on the end of the handle with their palm resting against or wrapping over the knob. The peak moment of compression, which causes thrown bats and broken hamate bones, happens immediately after the intended moment of contact with the ball (hit or miss). Because batters swing the bat around their body, their hands must roll over the knob of the bat. At that moment, the knob compresses the area of the hand called the hypothenar – the padded area of the palm opposite the thumb. 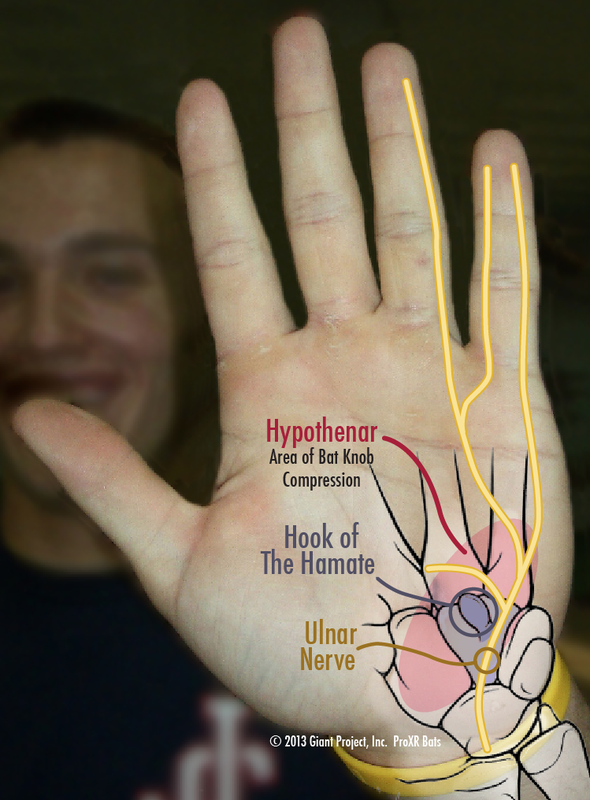 Underneath the hypothenar are the ulnar nerve (which controls the grip of the pinky & ring fingers) and the hamate bone. Both the ulnar nerve and the hamate bone are vulnerable to excessive knob compression. It’s that knob compression which can result in serious consequences like thrown bats and broken hook of hamate bones. Talk to a player who has just thrown a bat and ask them what happened. The answer will always be the same, “I don’t know, it just flew out of my hands.” Even with pine tar or other grip enhancements, they still threw the bat. Players will all look at their hands and wonder how it could have happened. The answer isn’t in their hands, its at the end of the bat – excessive knob compression. The most dangerous aspect of thrown bats is that they almost exclusively land in foul territory and usually fly over the dugout and into the crowd. It’s one thing for a 5-ounce baseball to land in the stands, but a bat weighs a minimum of 30-ounces and has an erratic flight pattern. There’s a reason people don’t play catch with bats! Most players grip the bat with their base hand firmly tucked against the knob, which perfectly aligns it over the ulnar nerve. The ulnar nerve carries the signal from the brain to the ring and pinky fingers and for gripping a baseball bat, those two fingers are the key to maintaining a strong and stable grip. In a fraction of a second, knob compression interrupts the signal from the brain to the hand. In that time, the grip of the base hand fails and the bat is released from the bottom gripping hand first. The top hand can only maintain grip for a split second more as the rotational/centrifugal forces pull it away from the batter. Watch the first video below carefully and notice how the top hand is the last to release the bat, which then helicopters out of the players hand. You will see the top hand follow the path of the bat because it was the last hand to release the bat. For reasons not yet known, it’s very rare to have a thrown bat occur when contact is made with the ball. My theory is that contact with the ball reduces the speed and force of the barrel of the bat just enough that the knob compression on the ulnar nerve’s signal is not interrupted. With the power and ferocity that bats fly into the stands, you have to be amazed that no one has been killed yet. Virtually every broken hamate injury in baseball occurs to the players non-dominant hand. Batters who throw right and bat right, or throw left and bat left, grip the bat with their non-dominant hand against the knob. The same knob compression that induces thrown bats is responsible for the broken hamate bone. In rare cases, players can break both of their hamate bones if they switch hit – like Pablo Sandoval did. The day I started setting up the video for this project, Gordon Beckham of the Chicago White Sox, broke his hamate swinging on a 2 & 2 fastball in a game against the Washington Nationals. Below is a link to the video of that swing. He just had surgery and is out for 6 to 8 weeks and will return about the same time this project will be in full swing. I would like to know how much that injury cost his team, his career and how it might impact his performance in the future. Below is a partial list of players who have broken their hamate bone swinging a baseball bat, either in batting practice or in a game. This is by no means a comprehensive list. If you’re an MLB or NCAA player who has broken his hamate swinging a baseball bat, let me know and I’ll include your name on this list. A typical question I am asked when players first see ProXR is ‘“Isn’t this just like a tool handle, like a hammer or ax?” No, not even close. We experimented with various tool handle shapes early in the development of the ProXR design. What we quickly learned was that any tool handle like a hatchet, sledge hammer or ax with an oval shape, is wrong for a baseball bat – round is the only solution. Every swing of a tool ends at contact with the object targeted by the swing. The oval shape of a tool handle helps drive the hands to the point of contact. The oval shape keeps the wrists “locked” in alignment with the swing. That “locked” position is perfect for chopping wood, but a bad solution for a baseball swing. Anyone who has swung a baseball bat knows that a baseball swing is rotational, which mandates the wrists to roll over the handle after swinging through the contact zone. That can’t easily happen with wrists “locked”. ProXR is specifically round in orientation to allow the wrists to roll smoothly through the swing, without hitting the speed bump effect you would get if you swung a hatchet, ax or conventional bat around your body.